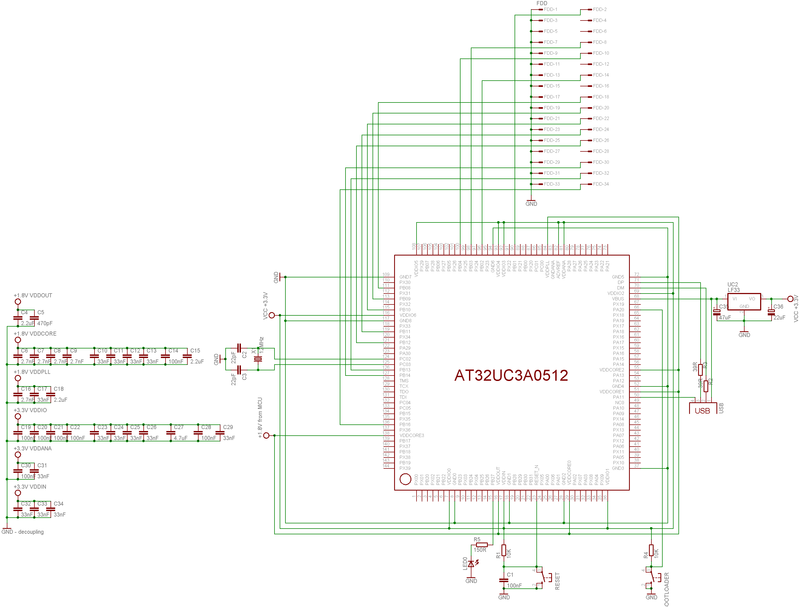 I'm building myself a floppy disk interface based on a microcontroller. I'm successfully reading the bitstream off the disk and (probably) decoding the MFM bitstream into actual bits, based on the documentation in http://www.hermannseib.com/documents/floppy.pdf, which is mostly excellent. However, there's one rather important bit which that document kind of glosses over, which is that I need to split the bitstream up into bytes, and I don't know where the byte boundaries are. The best I can make out is that the disk controller looks for the special deformed sync bytes in the block headers --- 0xC2 in the track header, and 0xA1 in the ID and data record headers. But this seems kinda weird, as it means that all the fill data which appears before the sync byte is unreadable; unless its only purpose is to allow the MFM decoder to sync to the data clock. It's particularly odd as the encoded bitsequence used to sync the data clock (two MFM cells of 00 01) is the mis-encoded sequence use to mark the sync bytes (three MFM cells of 10 00 10), so I need to know whether I'm looking for a sync byte or not in order to correctly sync the data clock (and likewise, I need to be able to detect the end of a block so I can start hunting for a sync byte again). Does anyone have any definitive information on how this is actually supposed to work? Aeh ... ok, but then again, why do you want to read it anyway? The fill data is what it says, just a meaningless filler. It if ment to provide some gap to allow different controllers (read with more or less timing difference) to interact. Otherwise Floppies wouldn't been exchangable, in fact, they could even be unreadable on the very same system. Maybe take a look at this answer regarding 'Whats between the sectors of a Floppy'. Syncbytes are (in MFM) a sequence of 12 bytes 00 prior to the access marks. These are ment to synchronize your clock, so the rest gets readable. 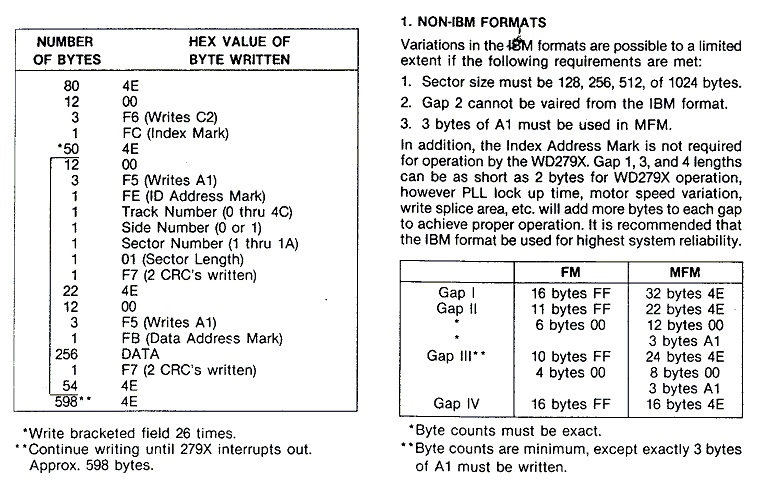 The mark bytes C2/A1 again are written with a sync error (*1), making them non data encodings or out-of-band (*2) formating codes on MFM level. Syncing essentially means reading bytes, forming bit cells until you get a sequence of several well formated 00 bytes and then keeping that clock for all further reads - until the end of a block that is. On a lower level (*3) a sequence of 00 bytes are just a monotone sequence of pulses with exactly halve the data frequence. So if the data written is for example 500 kBit/s, then this will be an exact 250 kHz signal. In this case 48 pulses. So whenever you see several pulses of equal distance, you need to take their timing to calibrate your detector (function). From there on it's reading bytes as synced (*4,5). If the next data read is a malformated mark, then continue (3 bytes) until the next right formated byte. If it's some mark qualifier (FB/FC/FE), then you found either block and continue accordingly. Otherwise, go back and look out for the sync sequence again. (and likewise, I need to be able to detect the end of a block so I can start hunting for a sync byte again). *1 - Having just three (partitial) mal formated bytes will not influnce the clock enough to make the following byte (F8/FB/FC/FE) unreadable, especially when this (and all subsequent) is again well formed. *2 - After all, if the MFM data stream would only consist of 256 legal byte encodings, how on earth should one detect what is user data and what's formating. The same problem all stream based communication without a signaling band has. Complex layers of framing just mitigate the erroe by adding more and more handling effort. Having an out of band signal simplifies that a lot. Forgoing a signaling chanel is main reason why the stream concept of Unix is nice, simple and error prone. *3 - Always keep in mind, these formats where not designed to be decoded by software using an unimaginable (back then) fast CPU, but simple and cheap logic. *4 - In fact, it's not even neccessary to count bits or bytes at that point, but only wait for a pattern change, as all bytes that follow a sync will always start with a one bit. *5 - A real controller will use a PLL which gets readjusted with every bit read. doing so in software may not be as easy. Its searching the bitstream for specific binary pattern which mark the stuff you are searching for. So the algo is to search binary pattern and then read out all the marker BYTEs used after it like 0x4E,0x00,0xA1 depending on the format used by FDC the floppy was created with. Its a part of a bigger engine supporting multiple file systems but should be enough to deduce the logic behind the markers and encoding/decoding of MFM stream. It functions exactly as you suppose. There are no separate clock and data bits in the MFM coding, you have to keep your clocking in sync with the varying bits flow from the disk. Early disk controllers used expensive analog PLLs for that, some later ones, assuming that bit rate won't oscillate that much, used simpler digital PLL-like circuits or even simple counters that were restarted every time next bit came from the drive. In order for that circuitry to function, you need some sync-in period, that could be as small as single "1" bit (I mean here impulse from the drive meaning there was flux change on the disk) for digital circuits or longer amount of impulses for analog ones. After you've got the bit sync, next task is to get the byte sync, for what exactly IAM/DAM/etc. are used as an easily detectable marker. After getting the DAM, for example, you keep the byte sync you've just got until the end of the sector (incl. CRC byte to be sure you've accepted everything correct). Even in the machines where the burden of MFM decoding left for the software (for example, Commodore Amiga), the detection of 'broken' bytes is still the task of hardware.